After waiting a very long time, I was able to see The Young Victoria at last. With so much in the news and in the movies about men and women tearing each other apart, it is utterly heartening to see a film about a pair of young lovers who save each other, politically, emotionally, mentally, and spiritually. Victoria and Albert each completed the other in body, mind and soul, becoming truly one as spouses are meant to be. Prince Albert was sent to his cousin Victoria by their uncle as a pawn in a complicated political game. Albert, however, turned out to have a mind of his own. After meeting Victoria he decided not to be a pawn but to be her champion, which he was until the day he died. He put his relationship with her ahead of everything else but he did so with intelligence and integrity, as well as passion. As he loved her, he loved her country, he loved her family, and helped to restore the damaged relationship with her mother. In the case of Victoria, she is portrayed as a young girl who, after gaining freedom from a stifling childhood, must learn the difference between strength and stubbornness. Her infatuation with charming Lord Melbourne, played to perfection by Paul Bettany, and her growing love for Prince Albert, are conveyed more by lighting and music than by words. Most especially her love for Albert and his love for her seems to slowly flood the film like the sun in the morning, until it becomes a blinding reality. 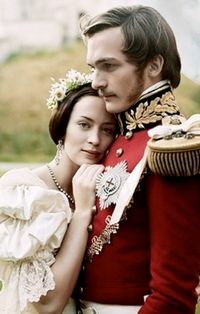 The viewer is as convinced as Albert and Victoria that their love will last beyond time; it is heartbreaking to ponder the long bereavement which Victoria will endure when Albert dies so young. 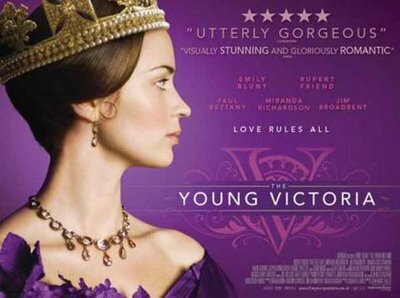 The Young Victoria is a work of art and, as others have said, it could be easily watched with the sound off, merely for the spectacle. Likewise, the soundtrack is exquisite; I have been playing the DVD over and over again as background music. 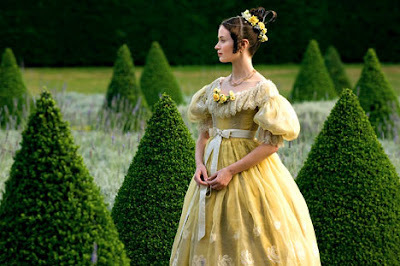 My only complaint is that the wedding scene was all of five seconds; the bridal party was not shown; I did not even get to see Victoria's gown, which I have no doubt was magnificent. I suppose, however, that nothing less than a recreation of the entire wedding ceremony would have made me happy. Any minor historical lapses are made up for by the powerful performances. Jim Broadbent and Harriet Walter are delightful as King William and Queen Adelaide; I would not mind a movie just about them. William's tirade at Victoria's mother at his birthday banquet is priceless, as are Queen Adelaide's calm and wise discussions with the headstrong younger queen. Rupert Friend is superb as Prince Albert; he captures the German mannerisms with ease. Emily Blunt's Victoria is a restless child, as determined to be a good queen as she is not to be ruled by anyone. Miranda Richardson is Victoria's mother the Duchess of Kent, who is easy to dislike but, by the end, is made lovable by Albert's respect and kindness. This is a must-see film for those of a romantic inclination. Anyone who loves history will enjoy it as well. The struggle for political power is an almost insurmountable force in the chess game of life. Love, however, is an overwhelming force as well, capable of changing the fate of nations and even the history of the world. 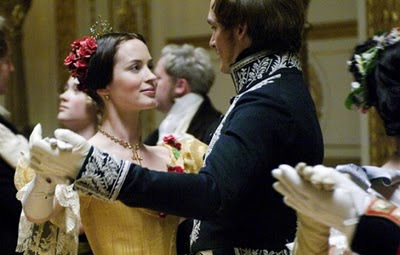 Queen Victoria: [to the Council] I am young, but I am willing to learn, and I mean to devote my life to the service of my country and my people. I look for your help in this. I know I shall not be disappointed. Thank you. I have not seen this film yet, but members of my family have. From their remarks (and Theodore Harvey's review) it sounds as though the portrayal of Victoria's uncle, Leopold I of Belgium, is too harsh. I have been told that he is presented as coldly ambitious and rather crude. Now, Leopold I isn't my favorite Belgian king, but I do think he had genuine affection for his nephew and niece- he was actually Victoria's favorite uncle! And he was admired by many, and called the "Nestor of Europe..." so I think he would have had more refinement and tact. Nonetheless, I'd still love to see this film- it is, indeed, an inspiring story and it is lovely to have a portrayal of Victoria as the vibrant young woman she once was, rather than simply as a widow in mourning. Thank you for another great review. I thought they showed Leopold as the brilliant politician that he was, as well as a responsible monarch, trying to pull some diplomatic strings that would help the Belgian people in the long run. If it had not been for Leopold's diplomacy as well as Baron Stockmar's grooming of Albert, Victoria and Albert may never have gotten together. That is what the film conveyed to me. Thank you for the review. It will be my next choice on Netflix! I actually got to watch this movie on a plane flight recently. (Amazingly, the inflight movie is one of the few things that American does not nickel-and-dime you for...I'd better not give them any ideas!) I want to rent it again since the tiny screen hardly did it justice, but it was wonderful, brilliant, and romantic in the best sense of the word. The utter alone-ness of Victoria early in the movie highlights how important her relationship with Albert was. I felt quite sad at seeing how the young Queen had almost no one she could trust. Everyone tried to manipulate her for their own ends, even her mother. I don't think I will ever quite understand how her mother treated her. A beautiful movie, which I also saw mid-Atlantic, on a Virgin flight to New York last summer. I'm so glad you mentioned the performance of Harriet Walter as Queen Adelaide; I thought it was tremendous and it's always a lot of fun to see a lesser-known historical character get their moment in the Sun. Thank you for the review - you're the first person who's made me really want to see it! I agree, Gareth, Harriet was tremendous! Cinderella, everyone should see it! Based on your post, I purchased this movie for a Mother's Day gift. Now we need to know - is it suitable for young children??? Thanks. Yes, Cliff, it is suitable for young children, although some children under ten (especially small boys) might find it boring. "A Book I Just Couldn't Put Down"